One of the affected apps has the misleading name ‘Voice Recording free’. This app has basic functionality and is developed by a company called REHSU Lled. According to Google Play it has been installed by more than 100,000 users. Those who have installed the app, enter a free trial period of three days and after that period they have to pay €104.99 ($120) or €209.99 ($240) per month. A user on Reddit downloaded the app and didn’t unsubscribe from the trial in time and was charged $264.99. Obviously he complained about the charge to Google but the search giant told him that the charges were justified and that they wouldn’t refund him. Google told him the only thing he could do was to leave a negative review. 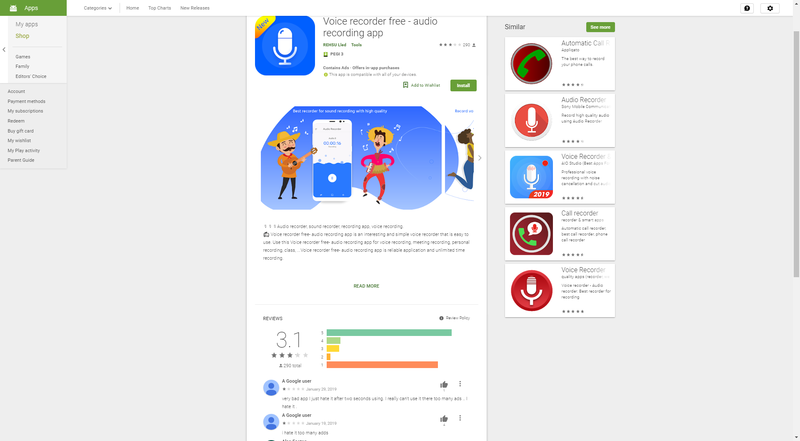 Currently the Voice Recording free app has 289 reviews with an average score of 3.1 stars. It’s unclear whether Google will soon act upon these kinds of apps which charge amounts that are disproportional to their actual functionality.